The results of adding a field to an Item Type will not cause any adverse effects to the existing items. It will, instead, add a blank field to the Item Type. To add a field to an Item Type you must be a Jama Admin. Select the Item Types menu, then decide which Item Type will get a new field. Select Config in the same row as the desired item. A window will appear to the right showing all available fields in that Item Type as well as options for editing the list of fields in the upper right. The icons are (from left to right) edit, move up, move down, delete and add a field. 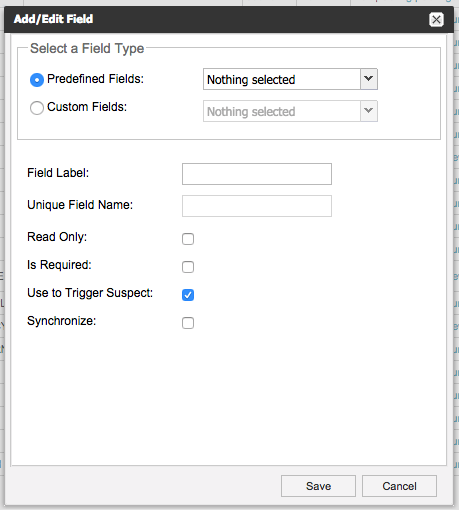 Add Field will open a dialog box where you can specify the details of the field. First, decide if this will be a Predefined Field or a Custom Field. A Field Label is required, as this is the field name that users will see. A Unique Field Name will auto-populate in an editable field when a Field Label is chosen. Once the field has been created and saved, the Unique Field Name will no longer be editable in either the UI or with the API. For additional information on adding fields, you can check out the Jama User Guide's entries on configuring an item type and modifying fields. When you have finished creating the field you must make sure it is viewable in the Review Center by going to Admin > Item Types, selecting Configure View on the item in question and using the drop-down menu to select Review Center Single Item View and Review Center Reading View. The Review Center Reading View is the default view that displays multiple items per page while the Review Center Single Item View displays just one item in detail. 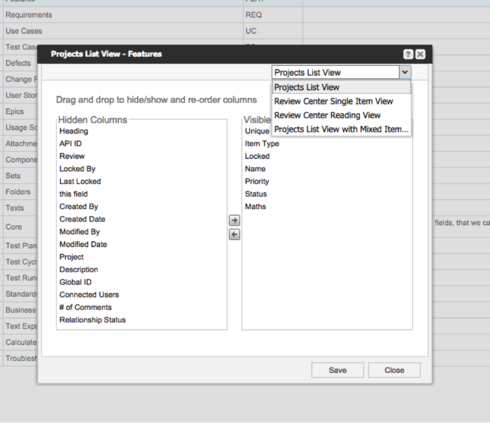 When you move the new field to the Visible Columns you can go back to your review and see your newly created fields. The new field will appear in the Review Center without a new revision. When you fill the new fields in, you will have to publish a new revision in order to see the data. Publishing a new revision will let approvers and reviewers know that there is new information to review. Hi Matt Thanks for this article. Can you please let me know, what will be the impact on existing data, if we adding a new required columns to an existing item? Hey, Bob. Thanks for the question. Creating and deleting a field won't have any impact of the functionality of the item itself but you will lose the data associated with that field. Here is some good reading about keeping data regardless if you delete or modify a field. Thanks, Chris, for getting back to us. Archiving a test plan means any of those Test Runs in the plan stop affecting the Test Case Status. So that would make me think the same Test Case existed in an active Test Plan as "Not Scheduled", but due to how the status is calculated that didn't reflect until the Plan w/the case in an executed status was archived. Thanks for the responses. On closer inspection, this issue was not system wide. Some test cases updated, whilst others did not. Consequently i may have found the real reason for my issue. It actually has nothing to do with adding new fields to the test cases. At some stage the system tester at my company archived a suite of test cases. When this happens a message appears saying the system is refreshing test cycles. Therefore those test cases in those newly archived test plans. So my theory is that the archiving process updated those test cycles which may have changed the status. However, again I am seeing mixed results. Either way, I believe the original issue is not an issue any longer and can be closed. @Chris, I think this is a good point to bring up. However, like @swoo my experience is not mirroring yours. Even if I add a new value to this field, the Test Case Status is remaining the same. The only way I can reset the status is by using the Make Test Runs Current option. Chris, if I'm missing a step I'd like to know so that we can pin this down and log something, if necessary. Accidentally changing all run statues to "Not Scheduled" is not a surprise anyone wants to run into! I added a new field "swoo test 1" to the test case. I actually don't see any changes in the version history or item activity stream. I also see the test run status not being modified. By going to the test run, when I open a test case, I see the test step status and test case status retained. If you still observe your issue, perhaps Jama can help you more directly. Good luck. I added a new field to the test case item type, the result being that all my test cases were "modfied" with this new field. The result however was that the test case status was also updated to "Not Scheduled" and subsequently when you do that, any coverage reports relying on the status field will no longer show the previous test run result (i.e., Pass, Fail, Blocked). Obviously since the test case is modified it will naturally not have been run, but since I was not modifying test steps I still wanted to rely on the test case status of my last test run. This isn't necessarily unusual behaviour for Jama but just a word of caution for those modifying their test cases. I'll check with our admin, make sure the images are posted correctly.